A full blown easterly, with trade winds touching 25 knots, provided for some thrilling action on the pristine blue waters along Antigua’s leeward coastline. Foaming surf with waves breaking over two metres today was about staying under control, especially off Turtle Beach which was prone to gusts approaching 30 knots. Start Boat A boats stayed in the vicinity of English Harbour, while Start Boat B boats enjoyed a passage race to Jolly Harbour. Genuine Risk came past Turtle Beach like an express train, surfing through the spray at an alarming speed but Hugo Stenbeck’s 90ft canting keel flyer was in perfect control. Genuine Risk rounded off a breath-taking downwind power slide with a technically difficult windward drop and ramped up the keel to spear off upwind at 12 knots. However, after corrected time it was Richard Matthews’ Humphries 54 Oystercatcher XXVIII that took the win in the first race. In similar conditions, Genuine Risk took the second race, squaring up the series. Tomorrow will see the conclusion of this David vs Goliath match. Oystercatcher XXVIII is currently ahead on count back. The Gunboats in Multihull 1 had a spectacular day on the water, blasting around the course today, picking up waves and searing through the surf at great pace. Greg Gigliotti’s Gunboat 62 Tribe scored its first win of the regatta and Lloyd Thornburg’s Gunboat 66 Phaedo and Eduardo Perez-Bengochea’s Gunboat 62 CucuBelle had a dead heat on corrected time. In the second race Phaedo lost her spinnaker halyard at the top mark, which eventually resulted in a third place for the last race of the day. CucuBelle is hot favourite for the big cat class. In Class 2, Peter Harrison’s Sojana revelled in the fresh conditions and powered its way to two bullets today, opening up a five point lead on Carol Swift and Stefan Lehnert’s Passion 4 C which scored two thirds today. Mark Bishop’s X-612 had its best day of the regatta. The BVI crew scored two second places and as a result climbed to third overall. Phillip Lotz’s American Swan 42 Arethusa has a virtually unassailable lead in Class 3, but there is a very close battle for second place between local boat Lost Horizon and St. Maarten-based D Trip which are level on points going into the last race. Puerto Rican Steve Crooke’s Smile & Wave finished the day in fine style, scoring its first win of the regatta. Tampa-based First 40.7 Elandra has fully wrapped up the overall win in Class 4. Having scored seven bullets, Calvin Reed and his crew need not even sail tomorrow but this looks like a team that just loves racing at Antigua Sailing Week and will surely go for a perfect eight tomorrow. Seamus Fitzpatrick and his crew on Mermaid V are visiting Antigua from Ireland and they have obviously now got over the jet lag, scoring their first podium win of the regatta. “That was just wicked out there today, most people only dream about racing in those conditions. Two races today were physically and mentally tiring but we just didn’t want to come in!”, commented Paul Adamson. 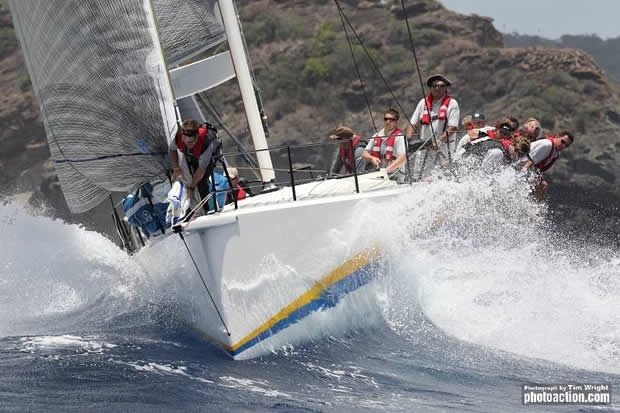 Jonty Layfield’s immaculate Swan 44 Sleeper leads Class 5 with just one race to go. Italian First 47.7 Alcor V applied some pressure by winning the first race but it all went wrong in the second, as Gennaro Aversano and his crew had a disaster with their spinnaker. Badly wrapped around the forestay, the kite couldn't be dropped on Alcor V during the upwind leg. Gallantly, almost tenaciously, Alcor V completed the race with the knotted and twisted sail stuck fast on its forestay. First 47.7 Global Yacht Racing steered by Andy Middleton had its best day of the regatta and the British boat is now level on points with Alcor V.
Division B headed out to Jolly Harbour and Ben Jelic’s Wild Devil Island Water World will be dancing on the beach at Jolly Harbour. Taking line honours and the handicap win in Class 6, Peter Bainbridge’s Sky Hunter II still leads the class overall, but is now just ahead of the wily Geoffrey Pidduck and his crew racing Antiguan 6 Metre, Biwi Magic. Tanner Jones’ Antiguan J/30 Blue Peter won the passage race to Jolly Harbour in Class 7 to overtake Bernie Evan-Wong’s Cal 40 in the overall standings. However, Rick Gormley’s First 38 Elethea retains the class lead and looks certain to lift the trophy at tomorrow’s prize giving. Class 8a has a new leader, David and Anne Chatterton’s Jeanneau 49 Resting Goose, won the race to Jolly Harbour today, lifting it above Andre De Smet’s Jeanneau 54 Derbisolar. Ian Galbraith’s Oyster 53 Jigsaw continued its consistent form and is third overall. With just one race to go, this class will be decided on the final race. Class 8b has most definitely been decided and Vincent White’s O’Day 35 Seal looks almost certain for the overall win in Class 8. Christoph Nielsen and his crew on KH+P Pinel are not invincible! Tony Mack’s Sugar Cane finally broke the German team’s run of victories by winning today’s long race to Jolly Harbour. Roger Hexton’s British crew has been coming to Antigua Sailing Week for years. Hexton’s team on Asterie, had a great race to Jolly Harbour and moved up to third overall in Bareboat 1. Alexander Pfeiffer’s KH+P Sea You Later has been battling all week in Bareboat 2 and it returned to its winning ways today. The race to Jolly Harbour took over three hours and KH+P Sea You Later won by just 23 seconds. Class leader is Alfred Geisser’s L’Oiseau des Iles. The boats heading to Jolly Harbour enjoyed a fantastic passage race today and tonight at Jolly Harbour Marina will be partying well into the night. Urban Hustle and Itchy feet will be rocking hundreds of revellers at the dock party. The penultimate day of racing at Antigua Sailing Week has virtually sorted out several of the class winners but many of them will be going to the wire in tomorrow’s last race of the regatta.